When I published ‘Progressed Sun, what it is and how’ (about Progressed Sun, Moon and planets) I promised to get into the whole progressed chart later. The way to calculate the frame (Ascendant, MC and houses) is quite different than the way to calculate positions of Sun, Moon and planets, as you may well know. If you know how to calculate a birth chart, it is rather easy to calculate a progressed chart, once that you have chosen a method. And that, selecting a method, is the most difficult step in the process. For those who want to 'progress' a Midheaven it is not easy to make a choice. They are confronted with: Solar Arc Midheaven, Primary Midheaven, Secondary (Progressed) Midheaven. You can also simply add 1 degree for each year. And there is a reversed version, too! Yes, there are even more ways to progress a chart than those that I mentioned here (see Wikipedia)! Because of the number of systems and methods I very much doubt that one of them is 100% perfect. I mostly use the secondary progression of MC because of the fact that it is the most used system in Europe (and I guess that this has a reason:). But I used the Primary Midheaven before (it is just that the program that I used is on an old laptop). Apparently, I haven't found the best way to progress a Midheaven, yet, even not after many many hours trying to 'correct' my chart so that the longitude degrees between planets would correspond perfectly with the progression of Midheaven or Ascendant. All methods give a different degree for the progressed MC for the same year. The difference is about 5.3 degrees for my own progressed charts for this year! That is difference of about 5.3 years in life time and the difference between a Progressed MD opposition Pluto, sesquisquare Saturn or sesquisquare Uranus. (Maybe with such progressions it doesn't really matter, they are all difficult:). The progressed Midheaven is the key to finding the Ascendant and the positions of the Progressed Sun, Moon and planets in the chart drawing (and in the houses). I use the progressed chart to see the changed priorities and the most important issues. There is more about progressions on Astromarkt, with a number of links to related posts. There are a number of blog posts about football on Astropost (just click here to start reading). 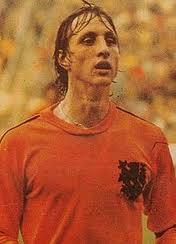 Here is one more because of the 65th birthday of Johan Cruijff. This is the natal chart with transits and progressions for his debut (November 15, 1964). The natal chart has a tight aspect combination of Mars, Jupiter and Pluto. Mars is exactly trine Pluto (intensifying energy, making muscles stronger:) and sesquisquare Jupiter. Look at that combination again and you will see that each of the three planets involved in the 'combination of successful use of energy' have an important position in the chart. a. The planet of drive, energy and competition is Mars. Mars, rises before the sun (planet of orientation field) and is strong in 'own' sign Aries. c. Pluto, for authority, is square Midheaven, connecting to the professional career. This triples the importance of Mars-Jupiter-Pluto! The distances of Jupiter, Pluto and angles (Ascendant and Midheaven) make the difference between the chart of Cruijff and the charts of others born on the same day. Ascendant and Midheaven are related to time and place of birth. But that is not all. Gender, genes, situation, conditions AND the chart worked together to make Johan Cruijff one of the best football players in the world. For that, you also need to be a man, you need to have the opportunity to play and you must get a chance. It is also great if the 'stars' are with you from the start (when you have a disappointing debut you might not get another chance). Transit Jupiter was conjunct his progressed Sun in the days of his debut. And transit Jupiter was exactly on the midpoint between Midheaven and Progressed Midheaven. PS Almost forgot to mention that AC/MC is sesquisquare Jupiter/Pluto! Also visit: Astromarkt.net for example about Mars-Pluto and the drive to win. There are elections in France, on two data. First round is April 22, 2012. Second round is on May 6. I included the charts of the two major candidates, Nicolas Sarkozy (now President) and François Hollande with transits and progressions for May 6 and I ask you: who do YOU think will win and why? Do the poll, please! The favorite candidate is Hollande and it is easy to see why when you look at his chart. Transit Jupiter (the great helper) is trine (pleasant aspect) his progressed Mars and that means: achievement, successful job! It doesn't look that easy for mr. Sarkozy, who has to deal with Pholus (the turning point) inconjunct (often meaning a loss) his progressed Mars. The meaning of that is 'turning point in a competition with a loss involved'. He also has a Sun-Uranus transit, which means change, not stability. Could it be that easy to see? I bet not. In fact, I know it is not that easy to say, because there is more. Nicolas Sarkozy has transit Venus inconjunct Jupiter (for a disproportional party) and transit Venus inconjunct Ascendant (for sympathy). (He might be lucky in love, even though he loses elections:). Transit Pluto square his Mars will intensify his efforts and demand a lot of energy. He promises economic restrictions. On the other hand, mr. Hollande has transit Saturn square Uranus, which means restrictions (or the protocol). Transit Uranus is conjunct his progressed Midheaven, so maybe that is a sign for a move into the Elysee. Mr. Hollande doesn't feel the crisis as much as Nicolas Sarkozy does. He promises that the French can stop working at age 60. That, and considering the inconjunctions in the chart of Sarkozy, makes me think that he has a greater chance of winning:). May I remind you of the fact that mr Obama sieged during a nasty Saturn transit (but that was the death of his grandmother). Who do you think that will be the winner? Of course I have to tell you that mr. Hollande has a Sun Leo and Moon Capricorn (very ambitious) with Pholus on Midheaven for a turning point in the career and Uranus rising before the Sun (he is a socialist). And that mr. Sarkozy is an Aquarius with Moon Aries and Saturn rising before the sun (very ambitious and revolutionary, even though he is a 'conservative'*). The charts are AA rated this time (thank you Astrodatabank!). 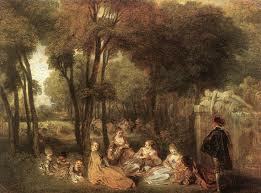 The picture on top is Watteau's view of the Champs Elysees in more rural times, kindly provided by Wiki Commons. *) Status quo in Europe was rather socialistic always, so a conservative wants change and a socialist prefers to keep the status quo or get back to those days. It makes it hard to see who is the conservative. In this case they are both ready for change (each one in another way). Where is Andres Felipe Cubides Ramirez? Spoorloos (means: without a trace) is a television program, often about reuniting lost family members or finding the natural parents for adult adoptive children. This time a Colombian mother told a sad story related to the Armero disaster of 1985. Mother Claudia studied to be a dentist, hundreds of miles away, when her village Armero was destroyed by mud. They told her that her son died, but they never found the body. In November of 2011 she watched tv about the Armero disaster when she suddenly saw her then 5 year old sitting on a table, partly covered with mud but clearly alive. What happened? Had he been adopted? Is he still alive? She wants to know. She said that her son was very sweet, and the chart of his day of birth confirms this: Venus calling! (remember? That is when Venus doesn't make tight aspects in sign). When Venus is calling you are a diplomat, lover or artist to be (and sometimes you will be!). And as a child you will be sweet, at any possible level! At the same moment that Juan Carlos said sorry for shooting the elephant, the press spoke of his mistress, a princess, and of the fact that she is not the first one. On Astromarkt I mentioned their marriage in an article named ‘Saturn in love’: http://www.astromarkt.net/saturn-in-love.html# On Astrology&Love there is more about the couple and the way that they do or don’t ‘match’. Saturn is the glue in a marriage. Often Venus-Saturn mirrors the ‘dulce (sweet Venus) decorum (decent duty)’ of the façade of a long lasting but practically dead marriage. Saturn is about obligations, parenthood, mortgages and other kind of glue that keeps the couple together for business sake or because of responsibilities and decorum. Saturn rules Capricorn. Juan Carlos has Sun and Venus in Capricorn. Sofia has Venus trine Saturn. I like to have a look at the present positions (transits and progressions) of their charts. The charts seem to be in line with the social position of Juan Carlos, who is being criticized because of his behavior in times of trouble. Yesterday, his wife returned from Greece (where she uses to spend her holidays) and she went to the hospital to see her husband for no more than 15 minutes. Short! That is Saturn in astrology. Transit Saturn is on Sofia’s descendant. Transit Saturn was inconjunct Progressed Midheaven. Saturn can be depressing and cold (like a 'dementor'). Her husband knows, because he has Progressed Sun conjunct Saturn (and trine Pluto, so he will survive anyway as it is the 'die hard' combination). Yes, Saturn is so conspicuous in their transits and progressions right now that you can't miss him.
! Even the chart positions of the wedding day (on May 14 it will be 50 years!) has difficulties: progressed Sun trine Neptune might make it a 'fairy tale' but there is and inconjunction of progressed Sun with Saturn and ... transit Saturn inconjunct the Sun of May 14 doesn't help much, either. I wouldn't like to invite a disproportionate Saturn on my party! (Having a broken leg when you should be dancing is never nice:). - Saturn trine Pluto (a harmonic relationship between concentration and focus, being a 'die hard' (also for yourself) and having control): it is the tightest aspect combination and Pluto is opposition Midheaven for the importance of authority. He doesn't seem to have a problem with maintaining his status. The unaspected Moon and Neptune point at feelings of empathy and commitment at any possible level (up and down) and could also refer to the affairs that he had (Neptune in the 5th). Conflicts between Moon and Neptune are one of the 4 indications for divorce, specifically for men. In October 2010 a Dutch newspaper reported about a possible son of Juan Carlos named Alberto, born when Juan Carlos was only 19. Queen Sofia said in 2008, that she was a 100% Spanish. The Majorana particle was predicted by Ettore Majorana, a genius who disappeared at age 31. His chart and ‘disappearance’ looks like that of Grigori Perelman, a contemporary genius. That is what I found when I remembered the Saturn in Pisces of Grigori Perelman and started looking for more similarities in the chart positions, more specific I had a look at their Sun, Mercury and Saturn. I found that Perelman and Majorana both have Mars rising before the 'calling' Sun and Saturn in Pisces. They share a Mercury-Jupiter aspect. Both dealt with a challenging transit of Pluto when they withdrew or disappeared. 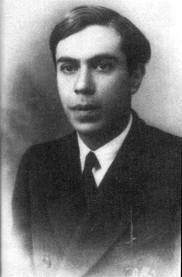 Ettore Majorana is the scientist who ‘invented’ the Majorana particle. After that he vanished on March 27, 1938, age 31. This is his chart (B-rated!) with transits and progressions for March 27, 1938. His Saturn is in Pisces. Mars rises before his sun. When he vanished it was in a challenging period with lots of stress, apparently, because transit Pluto was sesquisquare his Progressed Sun. His natal Sun doesn’t make major (Ptolemaic) aspects in sign or orb 5 degrees. . I name that a ‘calling’ sun: he will draw attention at any possible level. Charts of scientists often have a Mercury-Saturn aspect. Majorana’s Mercury is quatronovile Saturn. Majorana’s Mercury is septile Jupiter. Grigori Perelman is a scientist who solved a mathematical problem. He didn’t want to collect the prize and lives like a hermit (see the English Pravda: http://english.pravda.ru/science/tech/28-04-2011/117727-Grigori_Perelman-0/ ) His Saturn is in Pisces. Mars rises before his sun. When he withdrew from society, it was in a challenging period: transit Pluto was inconjunct his Sun. His natal Sun doesn’t make major aspects in sign or orb 5 degrees. He will draw attention at any possible level. Charts of scientists often have a Mercury-Saturn aspect, I said, but Perelman doesn’t have it. His Mercury is conjunct Jupiter. You don’t need to have a Saturn in Pisces to be a genius. Alan Turing’s Saturn is in Taurus, for example. Like in a lot of charts of scientists, his chart has an aspect between Mercury and Saturn: the novile. Mercury is inconjunct Jupiter. Just like in the chart of Einstein, Pallas is important in the chart of Turing. Pallas is 'calling' in the chart of Majorana. Charles Manson again tries to get out of prison: he appeals, even though his lawyer says that he is now totally institutionalized. I have written about Manson and Sharon Tate before (see links), but that was in 2008 and 2009. Meanwhile, you learn and see more (at least, that is what I hope)... So, here is another reading. Charts don’t mean destiny. Charts are telling us how to deal with the challenges of life (your mental health!, gender, genes, social circumstances and culture). There is no need to identify yourself with Manson, just because you were born on the same day or hour. It is what you do with the chart position, what you make of it, given the circumstances! I couldn't find a celebrity born on November 12, 1934 as an example of an alternative way to deal with the same kind of aspects. Anyway, this is the chart with transits and progressions for the fatal day: August 9, 1969. 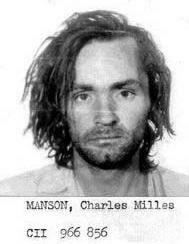 Charles Manson got tools to become the leader of a gang. He managed to break free from the social circumstances of his parents’ home. He also had the tools to make a mash of his life, ending up in jail. What astrological themes are highlighted in his chart? Jupiter is the most important planet in the chart of Charles Manson. Jupiter is on an angle and Jupiter rises before the Sun. Usually this is an indication for confidence, conviction and the importance of having social successes. In a way, considering his social background, there was a period when he ‘made it’. He had followers and he had influence. Mercury is angular, pointing at the importance of communications and opinions. Together, the importance of Mercury and Jupiter increase the power of communications. He has written several song texts (see here: http://leeaaron.tripod.com/manson-lyrics.html) And it seems that he gets thousands of letters of people who want to become a member of the Manson family. The elevated Moon in Aquarius (square Ascendant and conjunct Northern Nodes) points at the importance of moods, needs, habits and family. His gang was named the Manson Family. Charles Manson’s chart is not easy. He has Sun, Mercury, Venus and Jupiter in Scorpio. And all(!!!) of his planets are heavily afflicted! The tightest aspects are Moon square Mercury and Mars conjunct Neptune. The first (Moon-Mercury) describes a conflict between sense and sensitivity or at worst a habit of lying. The second (Mars-Neptune) can easily lead to using and/or abusing drugs. There is almost no harmonious aspect, it is all struggle, trouble and fighting, except for Venus sextile Mars (passion, and that doesn’t help much in this case). With Sun square Saturn in Aquarius (ruled by Uranus) and Sun quatronovile Uranus we see a double Saturn-Uranus theme, mirroring the issue of restricted freedom and the will to break free. 1. In the chart of the famous Dutch drugsdealer Klaas Bruinsma, Uranus and Neptune are very important. So it is in the birth chart of Charles Manson. Mars is conjunct Neptune and semisquare Uranus for being explosive under the influence of drugs. The combination is repeated several times in midpoint combinations. 2. Sun/Moon conjunct Lilith? Has this motivated him to enter ‘the wild side’ of life? 3. Midpoint AC/MC is sesquisquare Uranus and square Pluto. This is indicating a sudden transformation of conditions (like an arrest). - Saturn opposition the midpoint Mars/Pluto mirrors the issue of unnatural death. This midpoint combination can’t be used for judging, because it is in the charts of victims and in the charts of killers or witnesses. It also takes more than just one midpoint combination (and situations!) to ‘activate’ this Mars/Saturn/Pluto issue. - Jupiter, ruler 8, is quintile Midheaven (this points at getting away with it a bit...he was allowed to live but got life in jail). Today he will find out if this will be until he dies. - Sun sextile Midheaven makes him 'visible' and made it probably more easy to manifest as a leader. On the day that Sharon Tate and her guests were brutally murdered by members of the Manson family, transit Pluto was inconjunct the Progressed Midheaven of Charles Manson. An inconjunction of Pluto sometimes mirrors the price that you have to pay (the consequences). It is not always a pleasure to have an important Saturn in your chart. The ancient astrologers already must have known about the icy rings that surround Saturn as a barrier. How else could they have qualified this planet as reserved (cool) and as the symbol of restrictions? Sometimes Saturn simply drops you and the higher you climb the harder you fall. I recall the positions of the day of birth of late Amy Winehouse. 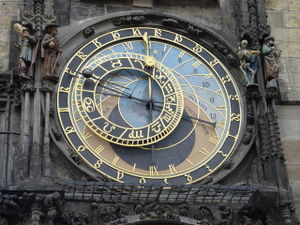 She had Saturn 'calling' (no major aspects in 5 degrees orb or in sign) in Scorpio (see: http://astropost.blogspot.com/2011/07/life-of-amy-winehouse-and-astrology.html ). Duty is calling, when Saturn is calling. The not aspected Saturn sort of demands you to be responsible, in control or ambitious, perfect even. The 'calling' Saturn isn't the only important Saturn. There is another way for Saturn to be important in a chart. Angular Saturn's are important. The angular position of Saturn says that all things that belong to the S of Saturn are of key importance; such as dignity, position, career, status, age, duty. The third way is when Saturn rises before the Sun. That is when your orientation in life is at 'Saturn' first. The classical, managing, controlling Saturn is cautious and materialistic, prone to be sure that there is enough money for casualties and enough food for the winter. It is lonely at the top in society. Sometimes you loose control and fall. It is also lonely at the top of the age pyramid. Yes, an important Saturn could also help you to get old, like in the case of a 107 year old. I have another example. A few months ago there was a documentary on local television about a 101-year old collector of donations. He was born June 3, 1911 in Rotterdam and taking good care of himself. Saturn rises before his Sun and there is no major aspect in sign. The importance of Saturn in the charts of the above mentioned two old men might of course include the importance of solitude. When you reach such an age you might be the only one left and you might have seen your partner, friends, children and even some grand children die. That might be just as unpleasant as when Saturn means 'endings' and 'farewells' at young age. Or, when you have an important Saturn, you might enjoy the fact that you managed, on your own or with some support, to get on top of the age pyramide. Both old men had their Suns in aspect with Jupiter and Uranus and other indications for the possibility of getting real old. See Astromarkt about aging or use the label 'old' here if you are interested in the subject. Just read that Nicole Kidman**) will be Grace Kelly in a movie about a political hot period (1961/1962) in Princess Gracia of Monaco’s life. Interesting to see that Nicole has Ascendant Scorpio, just like Grace Kelly had! That must make it easier to ‘act’ as the late Princess. You think that the Ascendant Scorpio 'shows'? Interesting besides: Nicole's progressed Sun is now exactly on the Midheaven of the natal chart of Grace Kelly. Her life is now 'connected' to Grace Kelly's. I have written about the death of Grace Kelly *) before, but now I wanted to have another look at the chart. I wanted to see what progressions and transits and what in the natal chart lead to becoming Princess Gracia. There is an important role for the setting (women's roles, high society) and Neptune colors it. That is why I like this picture of her, dreamy and old fashioned romantic and ...classy:). Every chart reading starts with the natal chart. This natal chart tells us about a talented and somewhat eccentric strong and mysterious personality with ambition. Convincing an audience (Mercury, Jupiter, Neptune) is important. She can communicate, convince and fake or believe at any possible level. She is also compliant (water signs) and not the kind of person to risk to be disinherited (Saturn). Why? Because of the chart positions. 1.Lots of water sign placements: they signal a tendency to go with the flow and be sensitive. Also lots of trines. Trines and sextiles make it easy to choose the easy way (out), the most desirable social way. Relate this to the influence of the parents and to the historic background (women were supposed to get married in the first place), the importance of catholicism for her parents and you will see that she must have been educated with the idea that marrying a catholic was most important. 2.Three ‘calling’ planets: they give an impression of the vocation. Mercury, Neptune and Jupiter don’t make tight major aspects in sign. They are ‘calling’. Mercury/Jupiter/Neptune could have made her a convincing 'story teller'. Jupiter-Neptune is the combination of speculations, an audience, fans and followers, beliefs and success as an actor. The midpoint Jupiter/Neptune is semisquare Juno (symbol of the wedded wife). Neptune is most important because Neptune rises before the sun. 3. Scorpio/Pisces and Neptune/Pluto colour the chart. Sun in Scorpio and Moon in Pisces with Scorpio Ascendant will not be very open and clear. Mystery and secret will go hand in hand. That is also because Midheaven is conjunct the midpoint Neptune/Pluto and they are the rulers of Sun and Moon. MC=Neptune/Pluto mirrors the excentric or idiocyncratic personality (see this explanation: http://www.ptypes.com/idiosyncratic.html ). Sun in Scorpio trine Pluto is the tightest aspect in this chart. Notice that Neptune and Pluto are elevated. It is hard to overlook the grand trine of Sun, Moon and Pluto (easy transformation through intense family life or challenging marriage) and spotlights on influence, politics, money, power and sexuality. It is the trine of a strong personality. 4. Moon in Pisces biquintile Venus in Libra and Venus in Libra sextile Neptune out of sign; Neptune is ‘calling’! – no tight major aspects in sign... That is astrological for talent! 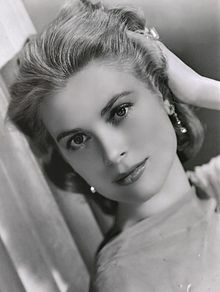 There is no direct connection to Midheaven however, and Grace Kelly ended more famous because of her marriage than because of her acting. found the pattern of artistic talent. 5. Ac/MC is square Saturn in 2nd house and that tells us that ambition is important. (‘Conservatism is comfortable’ says Noel Tyl about this combination). Saturn is in the 2nd house of earning money. That is where her center of gravity is. Seen as the 5th of the 10th house, the 2nd house is the house of showing off your status and Saturn doesn’t really show off, unless there at the saturnalia. Saturn in the 2nd house tells us about the importance of consistency of the verb ‘to have’. Talent and ambition drove her to New York at young age. She left the house of her wealthy parents to become a model and an actress in 1947. That was with Transit Saturn and Pluto on her Midheaven, Progressed Sun trine Uranus and transit Jupiter on her Sun. In 1951 she had a tiny role in her first movie with progressed Midheaven conjunct Neptune en progressed Sun conjunct Mars and …inconjunct Chiron in the seventh house. In 1953 she became more known. That is after transit Jupiter opposition Sun and with Progressed Sun opposition Jupiter and square Quaoar (a bright new world). At that time, in 1953, she was engaged to mr. Cassini, who was born April 11, 1913. Her parents didn’t approve of marrying a non-catholic, so this affair ended. His Sun was square her Sun/Moon (he was sort of made for her! ), but there suns were inconjunct (and that is easily creating lack of balance and a loss). There are also rumors about an affair with Bing Crosby in 1955. That makes you think why she was so fond of elderly men with a status. Venus sextile Saturn joins pleasure and business, so maybe that is it, combined with AC/MC square Saturn in the 2nd house. Perhaps also Juno in the second house is mirroring ‘marrying money’? But she could of course have married a young heir or a successful young actor instead. In fact she did what is supposed to be traditional for women who seek a solid basis for their children: they marry a man who is older. When you are ambitious and romantic at the same time, what is more fancy and romantic than becoming a princess? Three days after meeting him, she sayd yes to the Prince of Monaco. His Venus conjunct her Chiron in 7 may have healed the wounds caused by former relationships. She married with transit Saturn conjunct progressed Venus. Transits and progression repeating a natal aspect combination are stronger than other transits and progressions are. This one was a confirmation of the mix of business, convention and love that Venus and Saturn is. When Rainier asked her to marry him her progressed Sun was moving towards an opposition with Ceres (symbol of motherhood and dynasties). It was time to become a mother. Her daughter was born 9 months after marriage. She didn’t immediately give up on her career.That was later. In 1956 she made her last movie. In 1958 Albert of Monaco was born. A few months later they were in the Ed Sullivan show and in summer she and her husband traveled in Belgium (expo) and The Netherlands (Veere). They apparently loved to travel together and that is in line with the fact that both have an aspect between Venus and Jupiter in the natal chart. In 1958/1959 Neptune on the Ascendant and Pholus opposition MC reveal that there was a turning point in her life. Her husband wanted her to give up acting and she also accomplished her major ‘task’ as his wife: she gave birth to an heir. From that moment on she focused on philantropy. She was named President of the Monaco Red Cross. It is interesting that Neptune is the symbol of voluntary jobs and idealism (and of the movies!). The Ascendant is the symbol of the name of a person. In 1958 a hospital was given the name of Princess Grace. Venus-Jupiter is the symbol of the party and the 'good marriage'. Grace Kelly's chart has Venus sesquisquare Jupiter. The midpoint Venus/Jupiter is semi square Uranus. That is maybe why she married 'well' so quickly. There is also a semi square between Juno (symbol of wedded wife) and Jupiter/Neptune. Should I read this as a fairy tale marriage? But perhaps it is better to look at Midheaven and see the sextile with Jupiter and trine with Uranus for a combination that says: sudden windfall and improvement of position. But there must be more, not? In her solar return chart for her birthday in 1955 Jupiter was conjunct Pluto and sextile natal Venus. Maybe that helped. And not to mention the Leo Midheaven. Leo is a royal sign after all:). *) PS in short about the day of the accident, caused by a stroke: Transit Saturn was square her Sun/Moon midpoint, Progressed Mars conjunct Saturn separating and Progressed Mars and Saturn were semi square natal Sun. Mars-Saturn blocks energy, Saturn is for endings. PPS Unlike the Sun-Saturn wives of European heirs to the throne Grace Kelly doesn't have a Sun-Saturn aspect. Or does she? There is novile between Sun and Saturn within a 1.5 degree orb. Sun Saturn and the scapegoat? Today it is April 4. In 1968 Martin Luther King was murdered on April 4. So I had a look at his chart and than I got interested in the chart of the man who presumably shot him: James Earl Ray. I compared his chart with that of Lee Harvey Oswald. There are serious doubts about the involvement of these men. They both ‘confessed’ to the crime and later said they were not guilty. Now, would it be just coincidence that James Earl Ray and Lee Harvey Oswald not only have 2 forenames (and are supposed to have killed people with also 2 forenames)? More interesting for an astrologer: why do both men have a hard aspect between Sun and Saturn? I am just thinking out loud here...Why o why Sun-Saturn? James Earl Ray's chart is above. He also has an opposition between Mercury and Neptune. I have seen that before, for example in the - strange - Friedman case (link: http://astropost.blogspot.com/2008/11/capturing-friedmans-update-and-about.html ) and in the chart of a Belgian young man who spent years in jail after a false confession, innocent. Mercury-Neptune and Sun-Saturn were there in the chart of one of the West Memphis suspects: http://astropost.blogspot.com/2011/08/suspicious-aspects-re-west-memphis.html And Mercury is opposition Neptune in Amanda Knox’s chart. It is a difficult aspect for truth finding, as it seems. The family of Martin Luther King wasn’t convinced of the guilt of James Earl Ray when they had contact in 1997. That was when James Early Ray’s progressed Sun was square Neptune. It didn’t help him much. Fact is that James Earl Ray was a thief and a fraud. It was rather easy to believe in his guilt. At a certain point, his faults turned against him. Maybe that is one of the Sun-Saturn themes. It is easy to see them in the charts of dictators who come to the fall. Saturn is just the symbol of status, ambition, position and responsibility. Afflictions with Saturn make it hard to deal with duty, matters of guilt and debt and the career. Being blamed or being subject to criticism is one of the ways that a Sun-Saturn aspect might resonate in daily life. Self control (and control over others or being controlled) seems to be the main issue for Sun-Saturn. It is amazing that this aspect turns up in the chart of two suspects who left the world wondering about their guilt or involvement in historical murder cases. But maybe it is not so amazing when you read Sun-Saturn as the spotlights on your mistakes, faults and guilt (either by yourself or by means of judgement by others). The mistake of James Earl Ray was that he was a criminal and a racist, had a gun, was near the scene of the crime and that he said that he did it. And maybe that was all and the name of the real murderer of Martin Luther King remains a ? Charts (I can't say and write it enough) aren't judges and can't be used for guilt finding...Charts don't make scapegoats, they simply signal an important issue and life developments. When James Earl Ray was arrested, his progressed Sun had changed sign and his life style changed, completely. This was me thinking about the Sun-Saturn affliction in the charts of J.E. Ray and L.H. Oswald. Please think along with me about this aspect. Your take on it is welcome. I can understand the effect of Sun inconjunct Saturn and losing control over your life (see: http://astropost.blogspot.com/2010/10/sun-and-saturn-like-in-chart-of-gretha.html and think of Amanda Knox).